I’ve been lucky enough to have lived in Paris. It was one of the formative experiences of my life. I spent countless hours walking the streets with a camera, looking, not always successfully, for interesting ways to visually capture my impressions of the city while avoiding the standard photographic cliches. Paris is not an easy city to photograph. 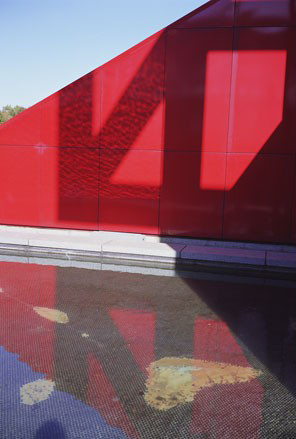 Its surface charms easily lend themselves to cliche. Certainly, Paris has its quick and easy visual charms, but Atget, Lartigue, Brassai, Ronis, Cartier-Bresson, Boubot, Koudelka and many more have seemingly exhausted a picturesque presentation of Paris. 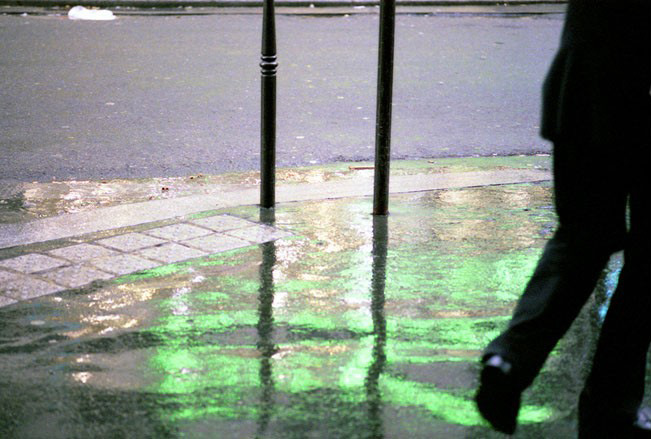 The last thing the world needs is another photographer recycling the same tired Parisian visual tropes. 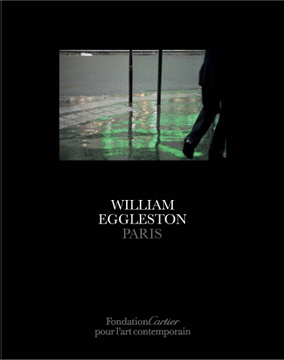 So I was mildly surprised when, visiting Paris last Fall, I found a monograph of William Eggleston’s photographs of Paris on my Parisian friend’s bookshelf. “Never heard of it, ” I mentioned to my friend Jorge as I pulled it from its place on the shelf and opened it. “Its junk, the sort of crap you get to publish because you’re famous,” Jorge replied. William Eggleston Paris is the result of an invitation from the Foundation Cartier Pour l’Art Contemporain in Paris to Eggleston to photograph the city and exhibit the results at the Foundation. In their notes advertising the finished project, they claim Eggleston spent three years working on the project. If you read the end notes carefully, you’ll discover he actually spent only a few weekends in Paris photographing. It shows. The work has all the superficiality of a bus tourist’s idealized idea of “The City of Light.” Give any aesthetically interested teenager an iPhone with an Instagram app and a few long weekends in Paris and they’d crank the same photos out endlessly. The difference, them not being William Eggleston, nobody would give them prime space in Paris to exhibit it, let alone publish and promote it internationally. Some photographers’ excellence is inextricably bound to a time and place: Atget’s and Brassai’s Paris, Winogrand’s New York City, Harvey Stein’s Coney Island, Paul Kwilecki’s small town Georgia. Memphis born Eggleston’s appeal has always been his use of color to present his laconic vision of American fly-over territory – the banalities of capitalist consumer culture. His “genius”, if we can call it that, was to see the role color played in the States in a way it doesn’t elsewhere, its vulgarity and ugliness when co-opted to sell things or to brighten lives made dull by the false promise of American consumerism. Speaking of his discovery of color, Eggleston remembered the day he “got it”: he decided one day to go to a large Memphis supermarket and take pictures of the shoppers, so American. He unwittingly overexposed the day’s film, and when he had them developed he saw the hidden meaning of the color pop out at him: “the first frame, I remember, was some kid pushing grocery carts. Some kind of pimply, freckle faced guy in the late sunlight.” Perfect. 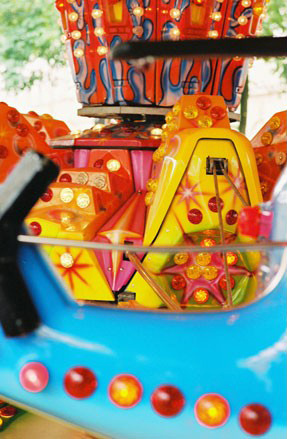 As for the Paris pictures, its hard to fault Eggleston for their failure. Knowing his dry humor, I half suspect he considered himself in on the joke. The fault really lies with the person whose idea it was commission the project. What could Eggleston’s aesthetic, so tied to its American context for its effect, have to say about a city and culture he could only know as a tourist? Expecting Eggleston to have a coherent, mature vision of Paris, simply because he’s William Eggleston, is wooly headed at best. Eggleston’s failed Parisian adventure should remind us of the vital importance of context to good photography. The best, Eggleston’s included, is the result of an idiosyncratic vision, often tied to a specific time or place, the time or place usually being an integral component of the idiosyncrasy. Subtract the time, or the place, and the vision it spawns, and you are left with mere photographs. Anybody with an iPhone can take a photograph. In my time in Paris, my friend Jorge and I made a habit to see as much work in exhibitions and galleries as we could. Most of it, even the wildly celebrated, frankly wasn’t very good. Some of it, like Antoine D’Agata’s work at VU gallery, was magnificent, instantly recognizable as quality stuff. After years of looking, we jokingly encapsulated what we learned in a few simple rules. Rule 1: Have something to say. Rule 2: If you don’t have anything to say, make your prints really big. Rule 3: If that doesn’t work, make your photos really colorful. Eggleston’s Paris photos follow all three Rules. 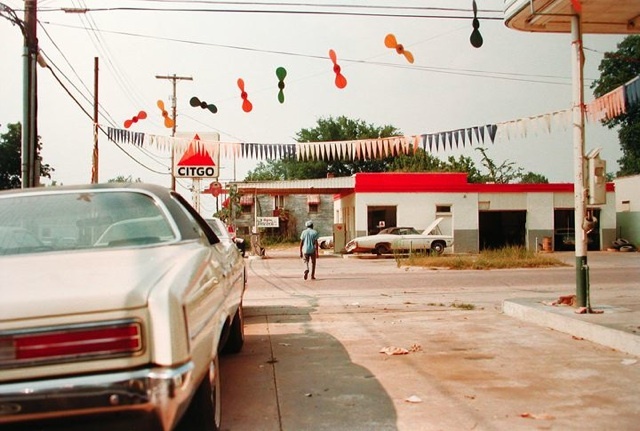 In Eggleston’s best work, the work that made him famous, color is intrinsic to the meaning of the photograph. Its not simply a garnish to draw the eye. His best photographs are not ‘about’ the color; they are about larger issues that the color is used in the service of. This is whats missing in his Paris pictures. The color here is pure ornament, eye candy to seduce you into forgetting that the picture has nothing to say. This entry was posted in Documentary Photography, Famous Leica Users, Leica Photographers and tagged Foundation Cartier Pour l'Art Contemporain, Paris, William eggleston on April 21, 2014 by Leicaphila.